I am going to begin this post by telling you once again how grateful I am for my husband. This is a man who took the whole “in sickness and in health” vow seriously. One of my biggest fears during treatment was making sure I had care for our children. I tried in earnest to get my ducks in a row before my surgery even happened but, unfortunately, we were let down by several people we trusted. Thank goodness for my community of friends and neighbors and most importantly, thank goodness for my dear, dear husband. He figured out a way to work from home during the most intense parts of my treatment. The boys often were at summer camps or eventually in school but I still needed him to take care of me. I was in a world of pain. I read somewhere that the point of chemo is to take a person almost to the point of death in order to wipe out any cancer. I questioned that statement but my husband agreed with it. “You don’t remember, but you were very, very sick.” he said. He is correct that I don’t remember most of treatment. I can’t remember celebrating my son’s 12th birthday. Although I do remember insisting on him having a cake. I can’t remember most of last summer. It’s strange but also a blessing. Anyway, I have said before, my husband stepped up to the plate in a big way. He took care of me and our two boys. He went to Back to School Night alone. He went to Music Booster meetings. He transported the boys to and from, he cared for me when I was at my lowest and he worked a full-time, high pressure job. And I am so grateful for more reasons than one. See, my biggest fear about this disease is that it will force me to leave my children…by dying. And if anything, last summer taught me that my boys will be ok. They have a great dad who will never let them down. Who will always put them first. It is a comfort. So that is my preface. Now I want to talk about the differences. I guess, first, I have to tell you a little about myself. I myself am not known for my housekeeping skills. I don’t enjoy housekeeping. At all. I like to shop for groceries. I like running errands. I like getting things done but laundry and dishes and cleaning are a pain in my tush. I feel like Sisyphus, pushing the rock up the hill, but the rock keeps rolling right back down. There’s always more laundry, more dishes, more poop to clean. Unfortunately, or fortunately, my husband feels the same way about housecleaning. It still is after 14 years, the only thing we really disagree over. Housekeeping. There is another part. We decided at the beginning of our marriage that we were not going to be spending our weekends in paradise cleaning the damn house. Instead, we do things like “commercial cleanings” where we get up during commercial breaks on t.v. We tried in the past to make it fun. Sometimes it is. But here’s the thing, I am the only woman in a house with three men. There are some differences. One thing is, a lot of my stuff gets broken. It’s not usually on purpose. But it happens a lot. I had this doll from my childhood. She was sitting on a high shelf and somehow, my son, age 2, got her and drew on her face with a permanent marker. I had this orgami box that a student had made for me. It was beautiful. My other son had his eye on it for years. One day, he found a step stool, got it down and tore it apart. He’d just waited for his chance. I tried to look on the bright side, at least I know he can be patient. My favorite lawn chair was taken out of the storage shed and left in the rain to mold on the side of the house because someone thought I didn’t use it anymore. Silverware is lost, dishes broken, furniture gets written on, knick-knacks are chipped. No one can explain it, it just happens. Usually, I just accept it. I’ve started to think the universe is trying to teach me a lesson in letting go. The other day, I noticed we were out of drinking glasses. Drinking glasses made of GLASS. I used to have a full set. And now they have all disappeared. My assumption is they broke while I was in treatment. No one is fessing up. So yesterday, I said I was going to buy some new drinking glasses. A logical solution in my mind. But my husband told me not to because he was ordering these. Yes…camping cups. He decided that our every day drinking glasses should be camping cups. And I immediately said NO WAY. He asked why and I promptly told him that I do not like the metal taste of camping cups…and they are ugly. He told me that there is no metal taste. Kleen Kanteen says so right in their advertising! And I told him that I don’t care what Kleen Kanteen says, I don’t like the way water or iced tea or lemonade tastes in a metal cup and that I was going to go buy some glassware that day. I told him he was free to buy himself a camping cup to drink from and that I would happily write his name on it with a paint pen but that I was not going to be participating in in-home use of camping gear. He tried to tell me that I wasn’t being GREEN and that this is going to be a new trend and I was limiting myself. There was some shouting involved (on my part) and there may have been a little swearing (also on my part). And my husband just shook his head, like I am such an idiot for wanting to drink out of nice glassware. So I headed down to the Crate and Barrel and this loud talker sales person helped me pick out the strongest sturdiest glassware I could find. 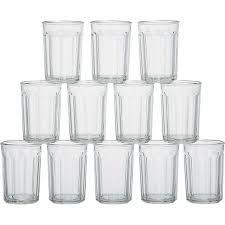 I got twelve glasses for under thirty bucks. They were not my top choice but they look sturdy and strong. And now that I did research. These guys are also apparently good for storage if you get some lids. But we also lose lids so blah. Probably not doing that. Look. I don’t have a problem with my husband and boys using camping cups if that what they prefer. 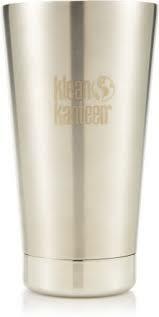 I realized that what made me angry was being told that I was imagining the metallic taste and that somehow Kleen Kanteen advertising supersedes my personal preference. And how is glass not “GREEN” anyway? And also, I can just imagine serving guests their drinks in camping cups. It’s just not my style. Maybe it’s yours and that’s ok. But it’s not my thing. My husband swears that metal cups are the latest thing and I am just old-fashioned or something. I am ok being old-fashioned as long as my water doesn’t taste like a tin cup. “IT’S STAINLESS STEEL!”, he says. So my point is that my husband is a wonderful person, a patient person, a kind person. He is my very best friend and I love him more than life. I have so much gratitude for his loving tender care of me and our boys and I know. Gosh do I know how lucky I am to have him. But we can still disagree about things and hopefully, there will be compromise. 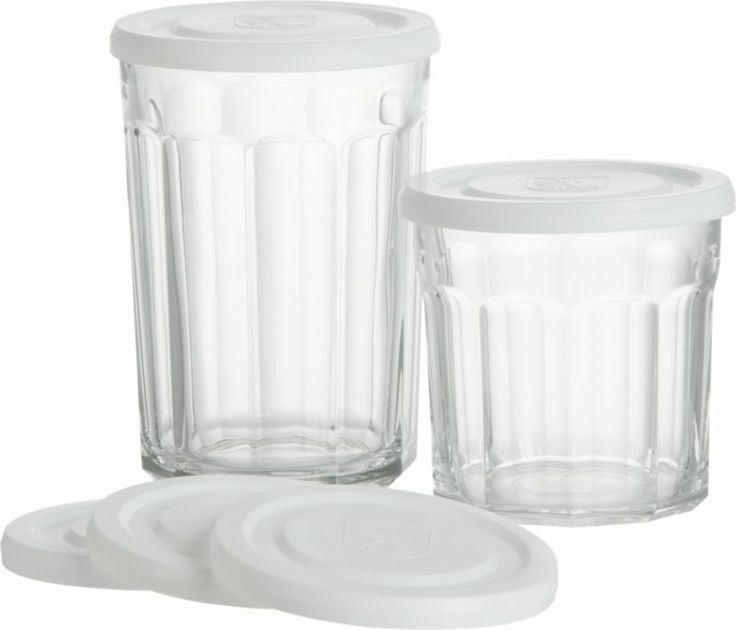 And when there isn’t, maybe the camping cups can live side by side with the working glass. Maybe? Also, I am wondering if for the rest of my life, whenever I am upset with him, I will have to preface everything with my gratitude for doing what he vowed to do fourteen years ago. There are worse things, I guess.